Alright – it’s official… my FIRST Halloween post of the season!! 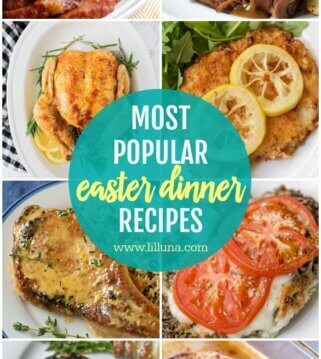 YAY – I’m so excited! I’ve been busy working on some fun projects, and I can’t wait to share them with you! 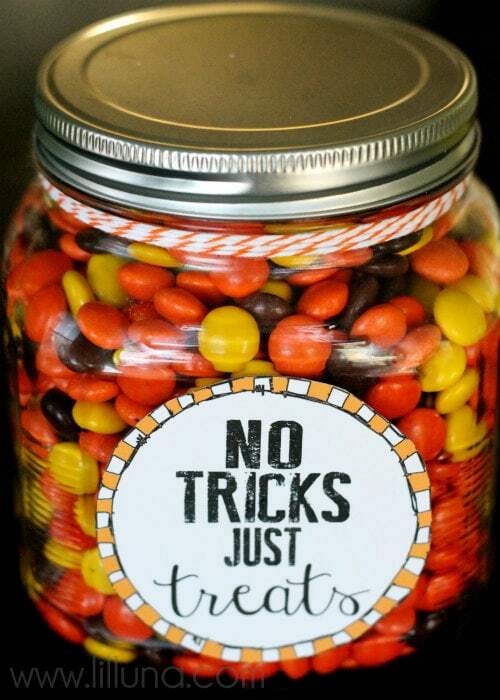 Today, I want to share with you my No Tricks Just Treats Jar. 1. 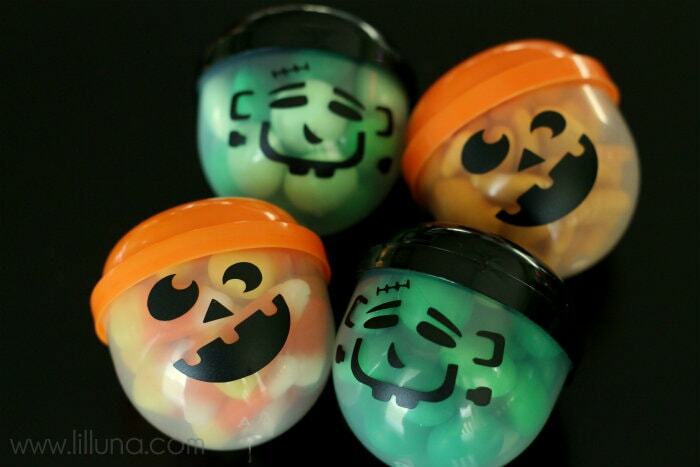 Begin by either cutting vinyl or drawing on Pumpkin faces onto your capsules. For the vinyl, I downloaded the dingbat: Punkinheads which can be downloaded HERE. I measured how big I wanted my vinyl face and cut it using my Silhouette. 2. From there you will fill your capsules with goodies. For the Pumpkins: Cheez-Its, Mini GoldFish, Reeses Pieces, Candy Corn, etc. For Frankenstein: Mint M&Ms, Green Sixlets or M&Ms (found at the candy store), Pistachios, etc. 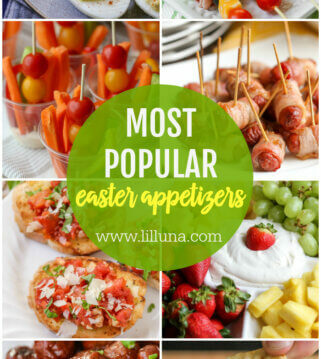 For a Ghost: Marshmallows, Yogurt covered Raisins, etc. 3. Add tops and pass out!! Now, since my kiddos have birthdays around Halloween I thought these would perfect for our Halloween Birthday Party that we do every year. I wanted a cute way to display them and wanted to put them in an inexpensive jar I got from Walmart. 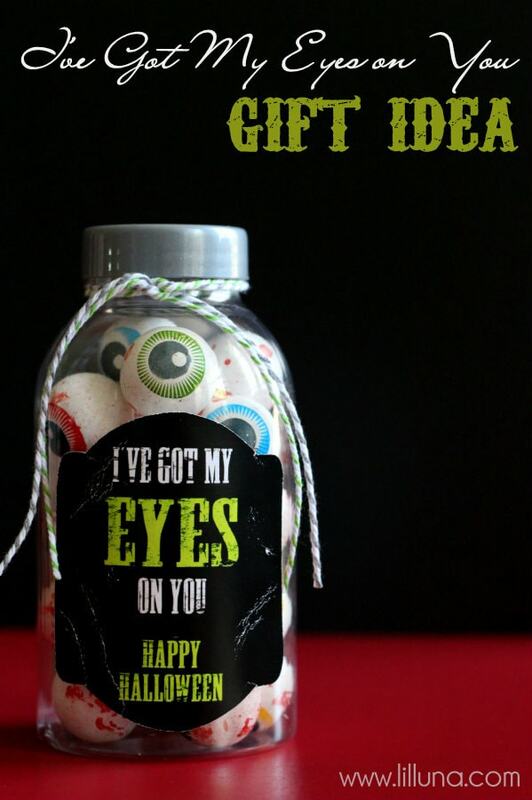 I decided to make some printable tags to add to the jar so that I could give it as a gift too. I made them in Apple Green, Tangerine and Purple, and I made them in THREE sizes – 2 inch (perfect as tags), 3 inch and 5 inch. From there I added them to my jar with some glue dots and added some twine to the top. 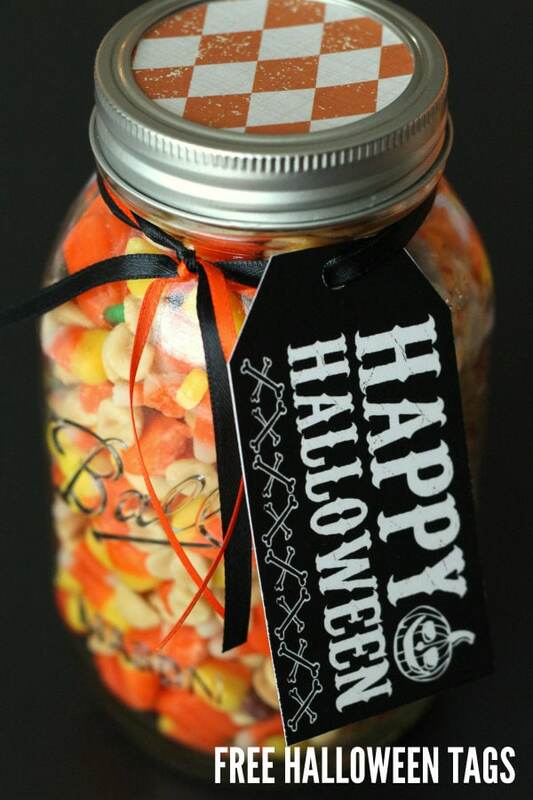 You could even fill the jar with any type of goodies, like I did with these Reeses Pieces or even with Candy Corn or other Halloween Goodies to make a perfect Halloween Gift. SO CUTE. SO EASY. AND SO INEXPENSIVE! Great post. I’ll be doing this! Too cute! I love the capsules!! Thank you for this cute idea! 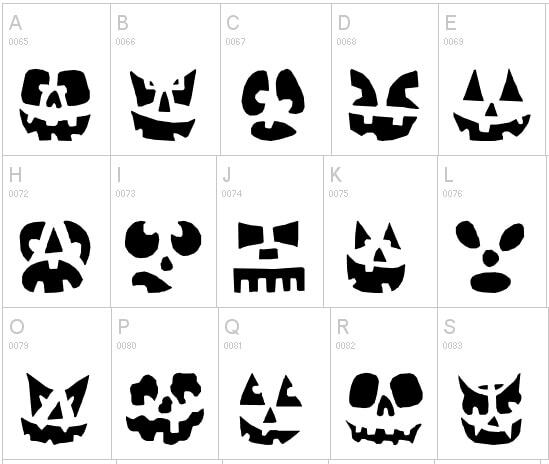 I just have a question for you…how do you upload the pumpkin faces into your silhouette library? I am not having success doing this. Thanks! I have an October birthday too. 😉 These are so fun! 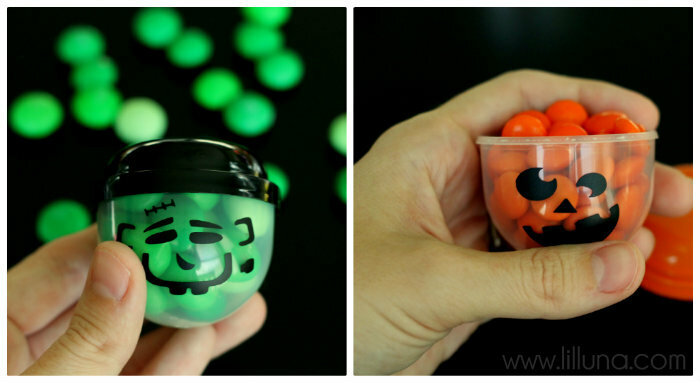 The little capsules make the treats seem cooler to little ones! What a fun idea to use vending machine cups!! I didn’t even realize you could buy those:-) Love it!!! So cute! 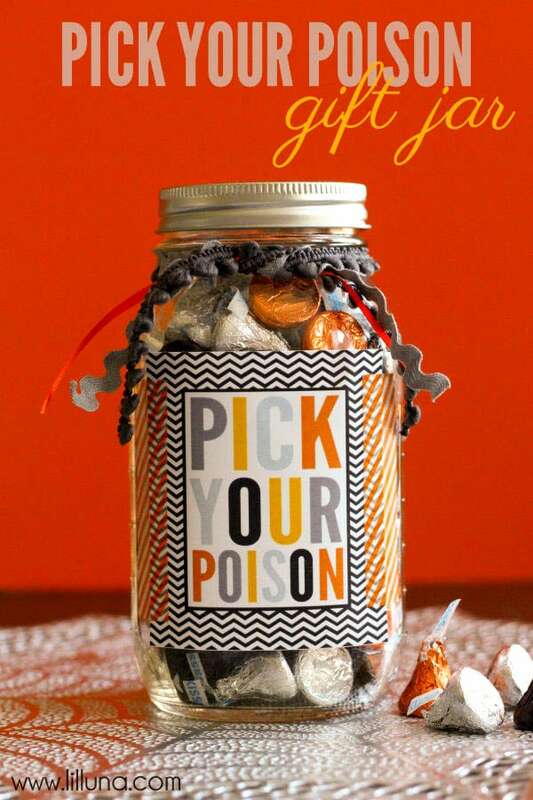 I hope you will link up to my Wickedly Creative Halloween Ideas Party if you haven’t already. 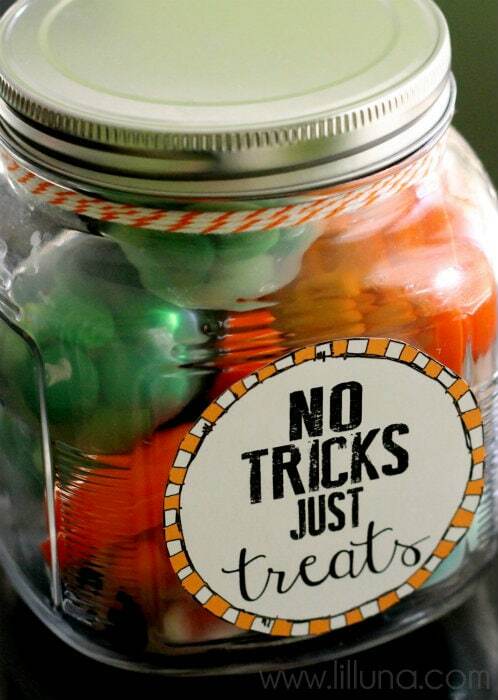 I love the idea of handing out the vending machine capsules filled with Halloween candy to my trick-or-treaters. I just don’t know how to cut the faces out since I don’t have a Silhouette and honestly I don’t know what that is. Is there another way to cut out the faces without one of those?? Hi Kristyn! 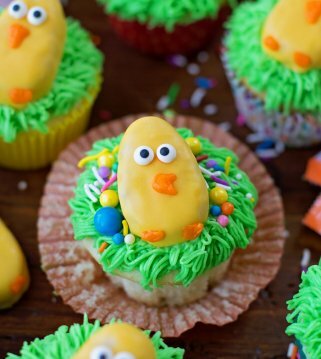 These are adorable and creative treats! 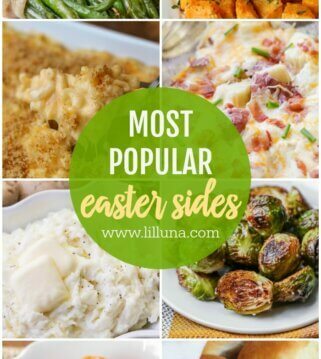 Thanks for the downloads! Just in time for Halloween! Have a great weekend! Blessings from Bama! 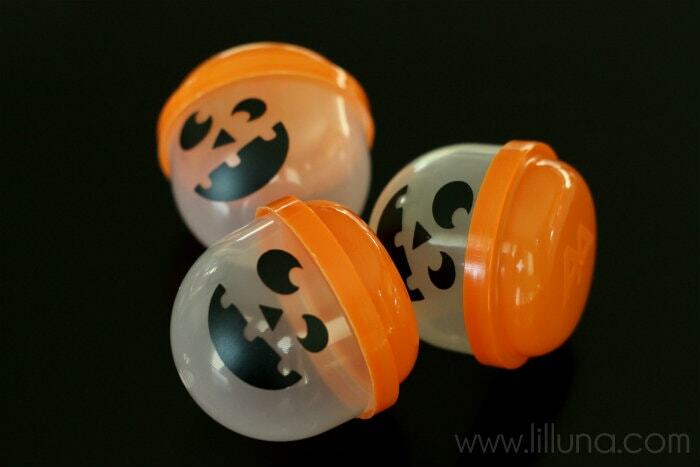 The vending machine capsules with Halloween faces are great! Where do I find the Frankenstein face? Pingback: Retalls de Festa – cuenta atrás…… halloween!!! 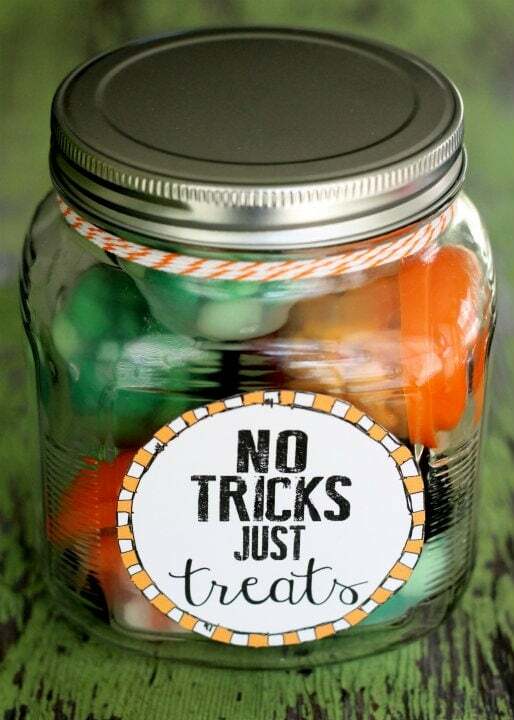 Thanks so much for the free printables, I am going to make the No Tricks just treats candy filled jars with my grandchildren, it will be a fun and easy project for them. 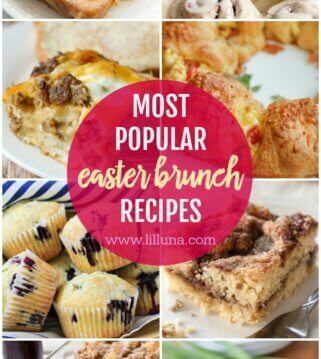 You are welcome!! I’m glad you found these!! Have fun with your grandkids!